Snow White, Superhero, and Wonder Woman inspired parties will never be the same with these gorgeous sprinkles! 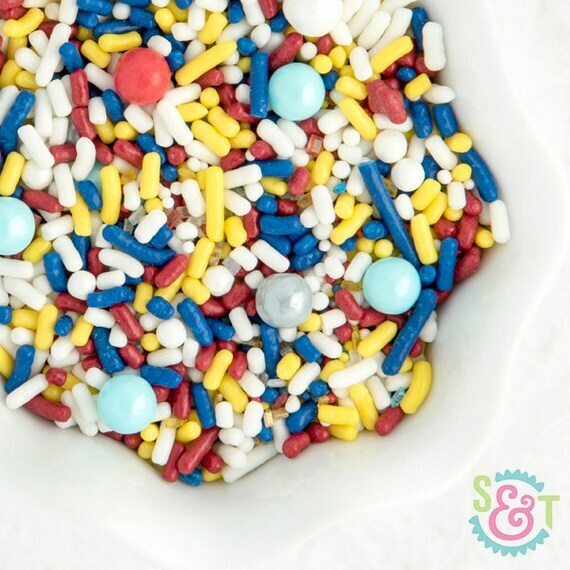 Packed with yellow jimmies, red sugar pearls, navy blue sugar crystals and other classic sprinkles to top your cakes, cupcakes, and cookies! Pair with our other party supplies for truly unique event. Good for approximately one year. Comes packaged in a clear, resealable food safe bag which has been heat sealed for freshness. Our 4oz volume bag contains a little over 1/2 cup (8-9 tablespoons) of sprinkles which is plenty for about 2-3 dozen cupcakes depending on how heavy handed you are!